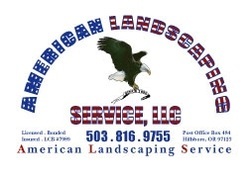 American Landscaping Service, Llc is a full service landscaping business in Portland, Oregon and is interested in doing business with you. We are your one stop shop for Landscaping Services, Landscape Maintenance & Exterior Home Services. We thrive for customer satisfaction. If you are tired of the hassle of fly-by-night landscaping businesses & individuals that are here today, gone tomorrow, if you are having difficulties with your current landscape service provider, please give us the opportunity to properly maintain your landscaping for your home and business to its fullest potential. Please note if you don't care about Quality, we may not be the right company for you. But if you are looking for an honest, reputable, and stable company with a proven 25 year track record of quality work, reliable service and a stellar business reputation, then Contact Us to schedule your on site Estimate or Consultation today.